Dissolve yeast in water. Add salt and sugar. Blend in flour. Knead dough until smooth. Cut into small pieces. Roll into ropes and twist into pretzel shape. Place on lightly greased cookie sheets. Brush pretzels with beaten egg. Sprinkle with coarse salt if desired. Bake at 375° F about 15 minutes. Soften yeast in the warm water. Add the honey and 1 tsp. salt. Blend in the flour. Turn out dough on a lightly floured surface and knead until smooth, about five minutes. 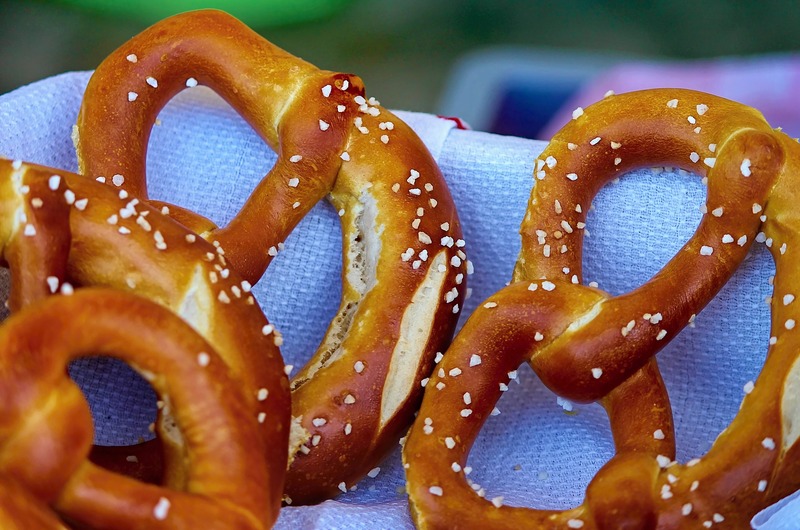 Roll the dough into ropes about 18″ long and shape into pretzel shapes. Place on lightly greased cookie sheet. Brush with beaten egg. Sprinkle with coarse salt or use sesame seed and Mrs. Dash non-salt seasoning. Bake at 425° F for 12 to 15 minutes until the pretzels are golden brown. Yield: 10 to 12 pretzels.